The first of 2 guided trips I booked was mostly a bust in a couple ways. It rained early that morning before dawn (which as I learned through the week can be a great sign or a terrible one depending on the guide or fisherman you speak with). But our guide for the day began bi***ing about the cloudy conditions before we even left the dock. 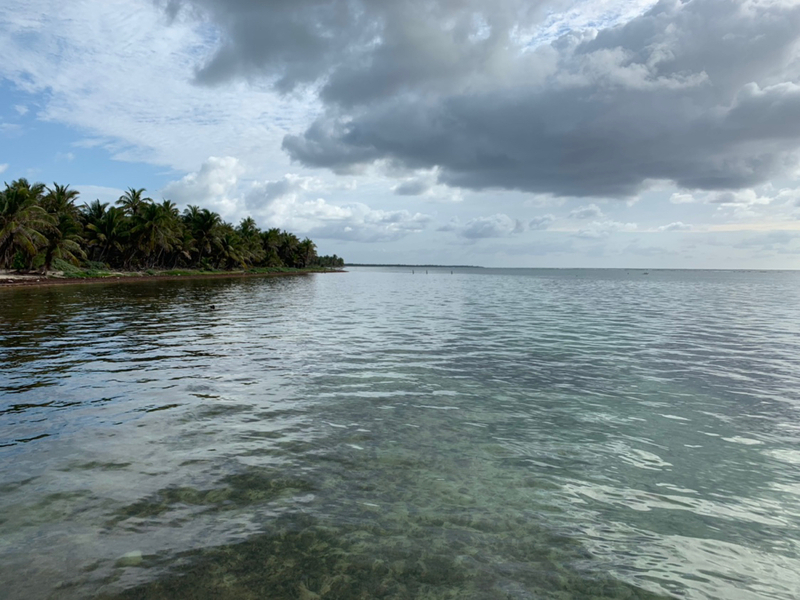 We then took the ~30 min drive up to the north end of the caye to target bonefish after he informed me "targeting permit would probably be a waste of time". About 5 min into actual fishing he suggests "man these clouds are ruining everything, if we don't catch anything by the time we get to that pole a couple hundred yards down we can just quit if you want and I'll tell the shop I had engine trouble and they'll re-book you". Well, at this point I'm thinking (a) I somewhat appreciate the offer as I know that's not normal given the only weather issue is clouds, but (b) I traveled a couple thousand miles and don't have another day open regardless so I can't rebook. I end up hooking a bonefish (first saltwater fish on the fly! ), and we saw several for an hour or so, so I didn't want to quit. 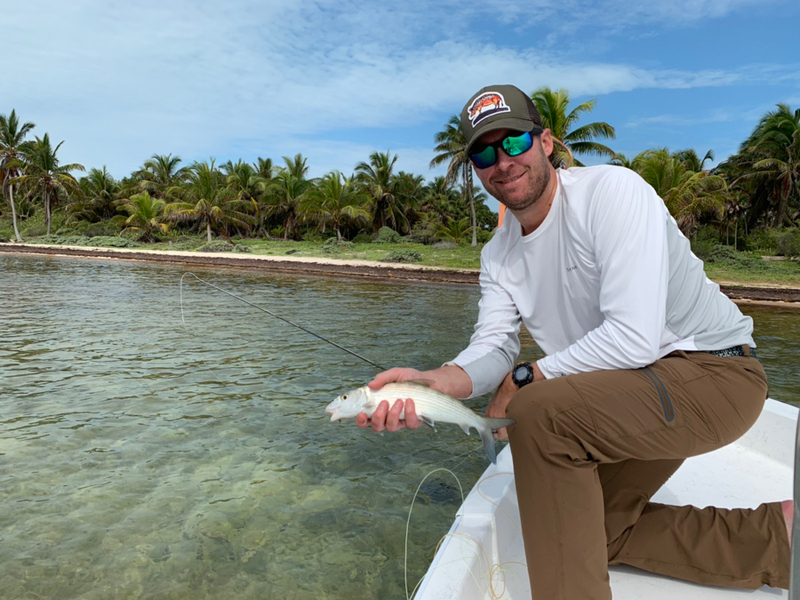 We proceed to target bones, and spotted a bunch, but mostly not until we were almost on top of them as we drifted/poled downwind due to the cloudy conditions (and the guide made it VERY will understood we weren't successful because the clouds concealed them until we were too close). Long story short(er), he pretty much complained about the conditions non-stop, then after his 3rd phone call in spanish which I understood a smidge of, he asks AGAIN if we'd want to cut the trip short, and the shop would "refund me half my money if we wanted to cut it to half a day". 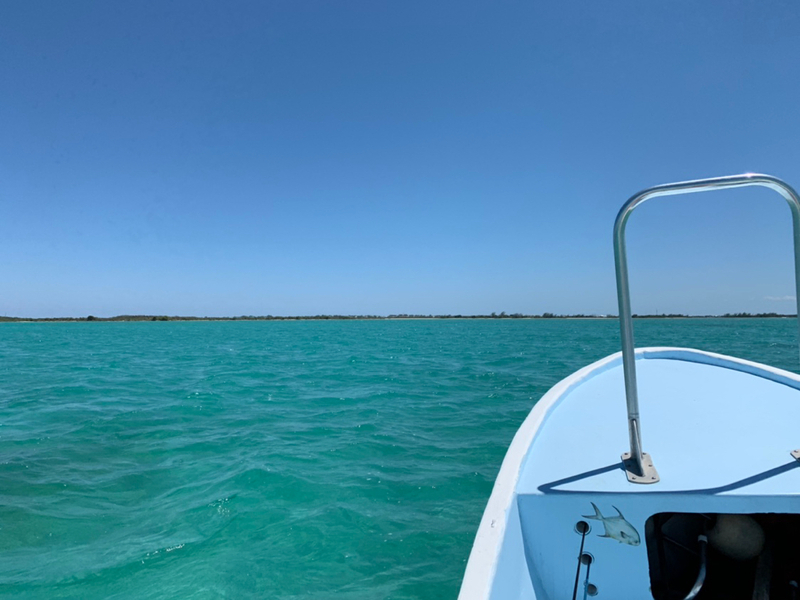 At this point his pessimism had rubbed off on me and I didn't want to spend another 4 hours on a boat with a guide who obviously didn't want to be out there so I agreed to call it. I'm not going to call out the shop involved because after a little back and forth regarding the amount of the refund, they made it right. So, second trip out 2 days later was much better even if I didn't achieve all I hoped for. I went out with Omar of Omar's Freelance guide service. 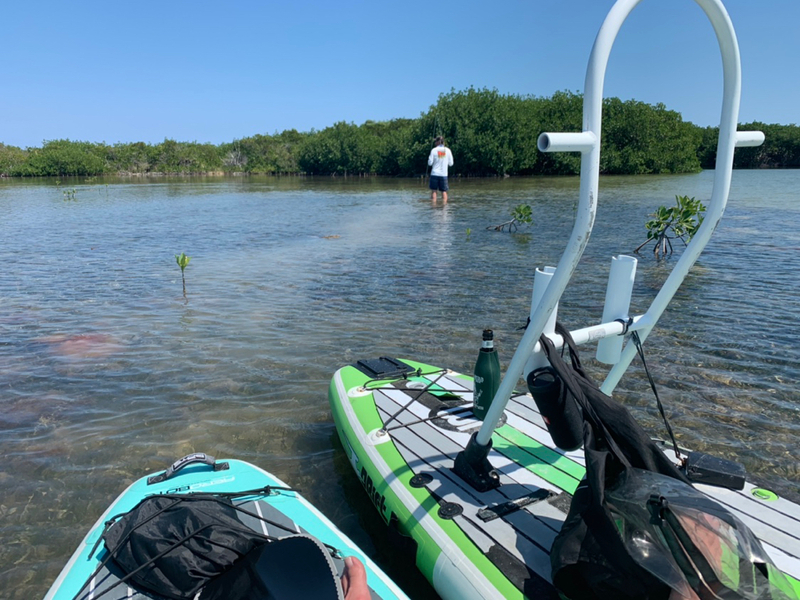 After a discussion about options and targets at the dock, we opted to target permit in the morning and bonefish in the afternoon. The first couple hours were spent hunting, then suddenly saw a school of VERY nice permit a few hundred feet out from the bow of the boat. Omar knew if he poled to them to get within my distance we would likely only get one shot, so we anchored probably 100 yards out and waded to get closer. However, they were just a bit deeper than anticipated, and we ended up stopping about 60' from the school, with me (at 6'3") almost chest deep and Omar standing on his tip toes to keep his shoulders above water! Needless to say those weren't the easiest casts I've ever made but I did manage to get multiple casts in and near the group. Then I had a good follow, I'll never forget the sight of that wake and fin following my fly as I stripped it back almost at eye-level due to the depth we were standing. But tragically the permit refused as did the rest after a couple more casts. We headed back to the boat to change flies then chased the school around for a bit before losing it. Ended up catching a few more bones over the afternoon. This trip was my first for bonefish, and given these were a small strain compared to the Bahamas and elsewhere, I now get the addiction! I caught all of them on my 9wt, and feeling how they fought even on that compared to similar-size trout, I can imagine how much fun the bigger ones are! As I mentioned at the beginning, our hotel the last few days had SUPs and kayaks available. 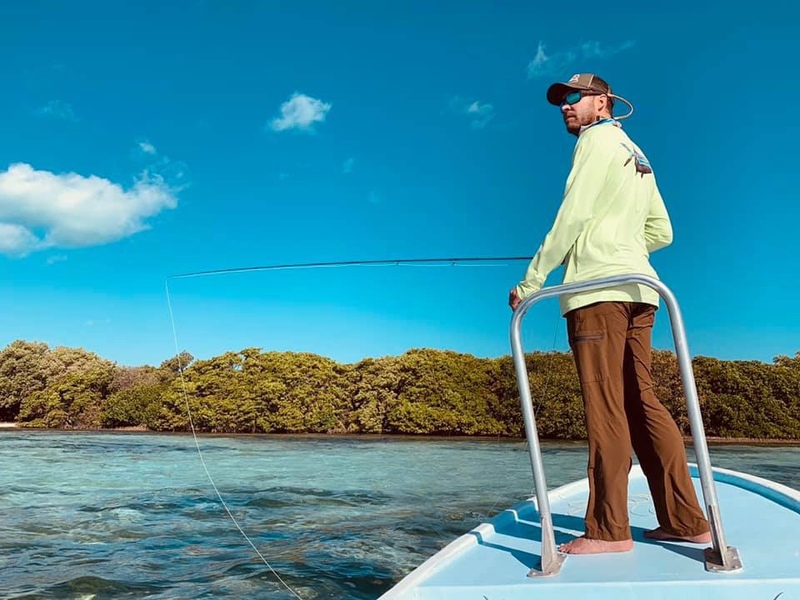 We took the SUPs out one day to a flat a couple hundred yards out and found a bunch of tailing bonefish. I hooked 2 but one shook the hook and the other broke my apparently bad knot. With that said, the couple hours we killed doing that might have been one of the most fun parts of the trip. I'd stalk the tailing fish from the SUP, find them, then anchor the sup and wade close enough to make a cast. I wouldn't have had any success without what I learned from my day with Omar, but now that I know the basics I was able to hook into a couple and know what to do on the next trip. Glad to hear you had some fun and some success. Your first day sounds terrible. There is no “made it right” when you travel thousands of miles and spend thousands of dollars and the guide essentially bails on you because of conditions. It’s his job to do his best and show you a good time regardless of conditions. Nonetheless, sounds like you kept your chin up and made the best of a bad situation. Those pics are awesome. The whole DIY paddle board/kayak part of the trip sounds appealing. Set your own pace, fish when you want. A half day of fishing in the tropics is a lot, I want no part of a whole day. Good share. I was on Ambergris Cay back in the early 1980’s for the scuba diving, but it sounds a lot more developed now. And yes I’d imagine AC has changed quite a bit since then. There’s a lot of development ongoing too, especially on the south end. San Pedro itself is not exactly a relaxing area to spend time in.